Sleep Tracking Without The Software! 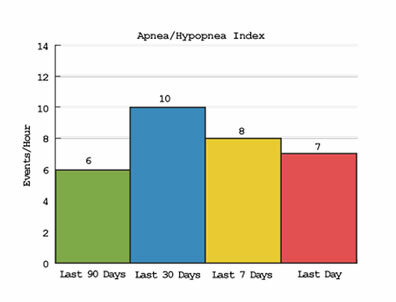 Sleep metrics are a great way to gauge the effectiveness of CPAP therapy. Whether you are feeling rested or tired, wouldn't it be nice to know why? Many manufacturers offer external components and software you have to purchase separately to track your therapy. 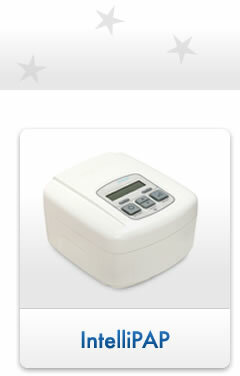 Unfortunately, most are fairly expensive, and require you to transfer information across devices. Once you enter one or more SmartCodes a report will be generated in your web browser. A combination of statistics and graphs (like the one to the right) will appear indicating measurements such as your AHI, NRI or EPI. To learn more about the meaning of various sleep metrics, please view page three of this sample report. Another good resource for understanding sleep metrics is CPAPtalk.com, but consulting your physician for report interpretation is advised. If you have already purchased SmartLink software, you can still use SmartCode for performance spot checks. You do not need SmartLink to use SmartCode. Wondering if your machine is SmartCode enabled? The bottom of your machine features a serial number right below the bar code. IntelliPAP AutoAdjusts with serial numbers higher than HD005578 have SmartCode capabilities. SmartCode may also be installed to older models of the IntelliPAP AutoAdjust, but will require a ps2 cable with a serial port connection to your computer. A link to the cable and the upgrade can be found here. The SmartCode data collection process is a huge step in providing affordable, sleep tracking therapy for those with Sleep Apnea. As always, CPAP.com encourages you to take an active role in your therapy and reminds you that these reports are a great tool to share with your doctor. We maintain a strictly opt-in newsletter. You are free to unsubscribe at anytime.